The Non-Disclosure Form informs the prospect that the information contained is confidential. In some cases you might not be allowed to include a nondisclosure. When possible, include one to prevent your prospect from sharing your proposal with competitors. If proposals are being distributed to competitors, make sure to request copies of other proposals being submitted. your contracts very useful and have used them as part of doing business. The web site contracts worked really great as I had to present them to a clients attorney and he found them to be very concise and accurate." This Non-Disclosure Form (Short Version) is included in editable Word format that can be customized in Word or by using the included Wizard software. THIS AGREEMENT is made this Current Day day of Current Month, Current Year, by and between Company Name (hereafter referred to as "Company") and Company Name (hereafter referred to as "Customer"). I agree that the information I am requesting from the Company is confidential, proprietary and may contain trade secrets. I understand that it will be provided in confidence. I agree not to disclose this information to any third parties and that my obligation of confidentiality shall extend for a period of three (3) years from the date of disclosure by the Company. After disclosure is published or otherwise becomes a part of the public domain through no fault on its behalf; or. Is or has been rightfully disclosed to it, by a party that has no obligation to the "owner" directly or indirectly with respect thereto to the extent that such third party disclosure is received without an obligation of confidentiality. 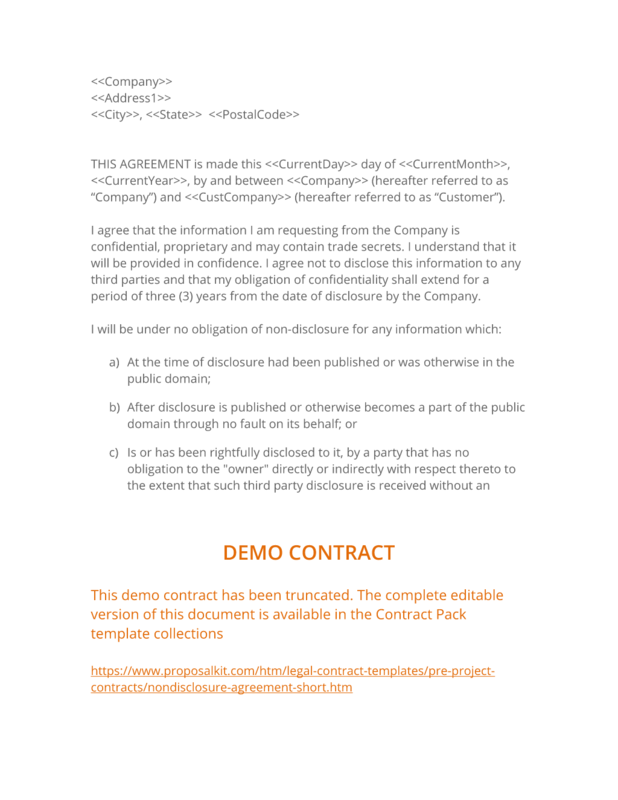 The complete Non-Disclosure Form (Short Version) - with the actual formatting and layout - is available in this Contract Pack.